Home Insights Diet, the Gut Microbiome, and Colorectal Cancer: Are They Linked? 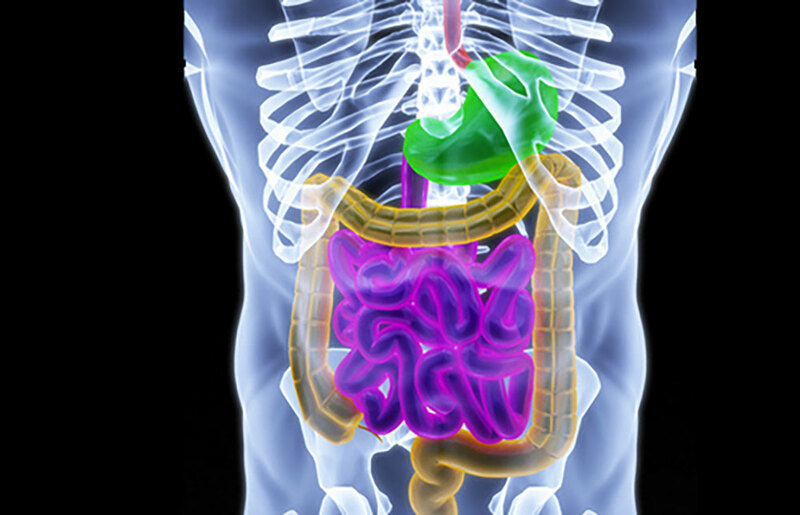 Diet, the Gut Microbiome, and Colorectal Cancer: Are They Linked? Most cases of CRC originate from epithelial cells of the colorectal mucosa, being identified by the formation of glandular structures and histologically classified as adenocarcinomas.5 The development of CRC can be didactically viewed as a systematic process with three main stages: initiation, promotion, and progression (Figure 1).6 In the initiation process, either spontaneously or after exposure to carcinogenic initiators, normal cells go through early unrepaired changes in DNA sequence and structure, which ultimately lead to their transformation into neoplastic cells.6–8 In the promotion phase, mutated cells undergo clonal expansion, promoting atypical tissue growth and tumor formation. In the progression phase, malignant tumor transformation and expansion take place with the occurrence of additional mutations, epigenetic alterations, and genetic instability.7 Thus, CRC development results from a progressive loss of normal control mechanisms related to cellular growth and differentiation. Owing to the fact that single mutations are not sufficient to trigger malignant transformation in the intestinal epithelium,7 an accumulation of multiple mutations in proto-oncogenes, tumor suppressor genes, and DNA repair genes is needed to complete the carcinogenesis process. Most genetic alterations are found in pathways related to Wnt-β-catenin signaling, tyrosine kinase receptors, TGFβ signaling, DNA mismatch repair, and genes linked to apoptotic pathways and cell cycle control.7 In addition to genetic alterations, the tumor microenvironment plays a critical role in CRC initiation and promotion, with the dietary intake and the intestinal microbiota being the most dominant factors of the luminal microenvironment in the gut. It has therefore been suggested that differences in diet and in the intestinal microbiota might be accountable for variations in CRC prevalence between two similar human populations. As an example, CRC is extremely rare in Native Africans, but considerably prevalent in African Americans (<1 case per 100,000 population vs. 65 per 100,000 population).9In these populations, O’Keefe et al. showed that a larger consumption of animal products and an increased colonic population of toxic hydrogen and secondary bile salt-producing bacteria among African Americans were associated with increased CRC rates, supporting the hypothesis that CRC risk is affected by the interplay between diet and the intestinal microbiota.9 This review discusses the current evidence covering the interactions between the intestinal microbiota and the host in the development and progression of CRC. Figure 1. Simplified representation of CRC progression. In the initiation process, normal cells go through early unrepaired changes in DNA sequence and structure, which ultimately lead to their transformation into neoplastic cells.6–8 In the promotion phase, mutated cells undergo clonal expansion, promoting atypical tissue growth and tumor formation. In addition to genetic mutations, environmental and microbial factors contribute to disease progression. Microbes may contribute by either promoting or suppressing CRC development, with bacteria being described as drivers and/or passengers of disease.58 In the progression phase, malignant tumor transformation and expansion take place.7 CRC, colorectal cancer. It is also important to point out that instead of having direct proneoplastic effects in the colon, chronic inflammation might work indirectly by targeting the intestinal microbiota to promote the expansion of microbes with genotoxic capacities.23 In line with this, Arthur et al. showed that inflamed IL-10-deficient mice exhibited a 100-fold increase in the E. coli community, and that colibactin-producing E. coli induced increased tumor multiplicity without altering the level of inflammation compared with nongenotoxic strains in monoassociation studies.23 These data suggest that inflammation per se might not be the main contributing factor in tumor formation and that inflammation-driven selection of genotoxic bacteria within the complex community of the intestinal microbiota may link colonic inflammation and CRC development. Figure 2. Simplified graphic showing three different microorganisms and their pro-tumorigenesis mechanisms. Enterococcus faecalis produces extracellular superoxide (O2-) near the oxygenated luminal surface of colonic epithelial cells. In this acidic microenvironment, O2– production spontaneously generates H2O2 that diffuses into the epithelium and forms hydroxyl radicals at DNA sites, leading to DNA–protein crosslinks, DNA breaks, and base modifications.41Escherichia coli of the phylogenetic group B2 carry a conserved genomic island named “pks,” which allows the production of a genotoxin named colibactin. Colibactin can induce DNA double-strand breaks leading to chromosomal aberrations and increased frequency of gene mutations. 22 ETBF is a subtype characterized by the secretion of a metalloprotease enterotoxin known as BFT. 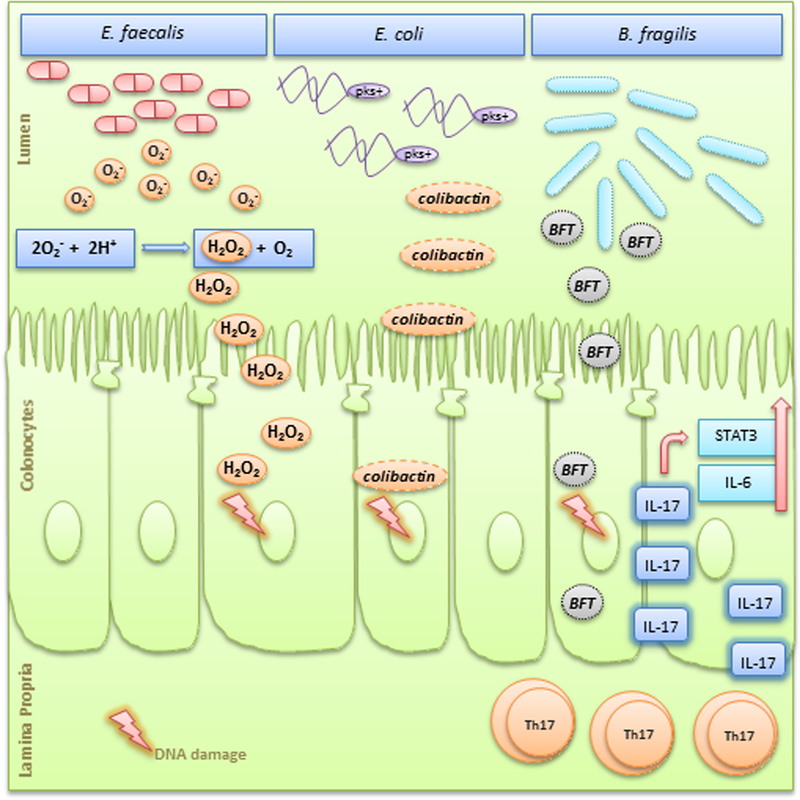 BFT is directly genotoxic to colonic epithelial cells and also stimulates cleavage of E-cadherin causing cell proliferation and breakage of the intestinal barrier. .58 BFT can also induce a persistent TH17-type inflammatory response with increased IL-17 expression and upregulation of STAT3 and IL-6, which have pro-proliferative and antiapoptotic properties.58 FT, Bacteroides fragilis toxin; ETBF, enterotoxigenic Bacteroides fragilis. Individuals with CRC display instability in the composition of their gut bacterial communities when compared with healthy controls (Table 1). However, these studies neither answer the cause or consequence question of dysbiosis in CRC, nor do they provide mechanistic insights by which the intestinal microbiota influences the development of CRC. Evidence for the association of human intestinal bacteria with CRC has stemmed from deep-sequencing technology, to date, provided by three independent studies that investigated microbial composition in healthy (off-tumor site) and late-stage CRC (on-tumor site) tissue.45–47 An enrichment of Fusobacterium nucleatum has been shown in CRC tissue, with a larger amount of F. nucleatum being associated with high degrees of microsatellite instability (MSI-high) and CpG island methylator phenotype (CIMP).46–48 Furthermore, F. nucleatum in colorectal carcinoma tissue was shown to be inversely proportional to the CD3+ T cell density, providing mechanistic evidence for the interactive roles of this microorganism in adaptive immunity,49 an important insight for the targeting of the microbiota and immunity in CRC prevention and therapy. A further validation for the connection between F. nucleatum and colon cancer, with a correlation to inflammatory factors, was provided by Wei et al.50The same study also first reported a patient prognosis value of B. fragilis and Fusobacterium prausnitzii through the induction of intestinal inflammation, suggesting all three microorganisms as potential prognostic biomarkers for CRC. The first high-resolution map of the colonic microbiota associated with human CRC showed that Coriobacteria were overrepresented, whereas potentially pathogenic Enterobacteria were underrepresented in patients.45 First experiments using Denaturing Gradient Gel Electrophoresis and Ribosomal Intergenic Spacer Analysis fingerprinting, indicated striking differences in microbial communities between tumor and off-tumor tissue. Subsequent FLX 454 titanium pyrosequencing revealed significantly altered community structures of the microbiota related to tumor vs. off-tumor sites at higher resolution. In these studies, CRC was consistently associated with overrepresentation of Coriobacteridae, especially of the genera Slackia and Collinsella, and underrepresentation of Citrobacter, Shigella, Cronobacter, Kluyvera, Serratia, and Salmonella spp. of the Enterobacteriaceae family. Shifts in microbial composition are often the result of dramatic physiological and metabolic alterations in the colonic microenvironment during tumorigenesis; these changes seem to benefit the rise of tumor-associated commensal-like bacteria with subsequent underrepresentation of Enterobacteria that might be linked to CRC pathogenesis.51,52 Some of these tumor-associated bacteria are major butyrate-producing microorganisms with potentially protective functions in CRC. In this regard, butyrate induces cell cycle arrest and increased apoptosis of cancer cells,53 but also serves as an energy source for neoplastic colonocytes. 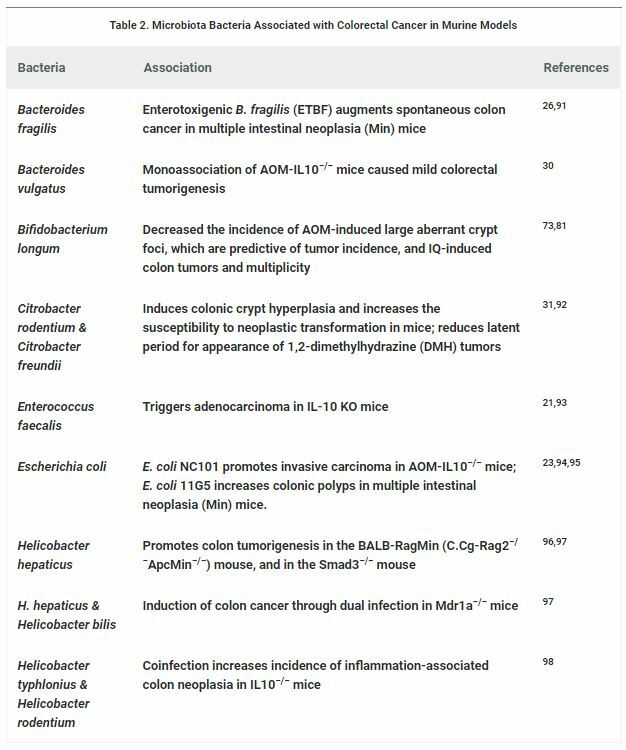 Studies addressing the role of the gut microbial ecosystem in CRC development using animal models are compiled in Table 2. The characterization of the gut microbiota in a murine model of AOM DSS-induced CRC has shown an enrichment in operational taxonomic units (OTUs) affiliated with members of the genera Bacteroides, Odoribacter, and Akkermansia,whereas OTUs affiliated with members of the Prevotellaceae and Porphyromonadaceae families were decreased.54Furthermore, the administration of antibiotics in this model resulted in a drastic reduction in tumor size and number, implying that changes in the microbiota directly contribute to tumorigenesis.54 In contrast to conventionally raised mice, germ-free glutathione peroxidase double knockout (GPX-DKO) mice as well as interleukin-10-deficient (IL10−/−) mice, treated with AOM, display normal colon histology and no tumor development.30,33 Furthermore, in the ApcMin/+ murine model of colon carcinogenesis, germ-free housing showed a reduction in tumor burden, and the introduction of B. fragilis or F. nucleatum increased carcinogenesis.26,55,56 These results provide in vivo evidence for the influence of bacteria on carcinogenesis. Nucleotide-binding oligomerization domain-containing protein 2 (NOD2) is a cytoplasmic pattern recognition receptor that is linked to the development of Crohn’s disease in humans. Dysbiotic microbiota in NOD2−/− mice contributed to the development of colitis and colitis-associated cancer (CAC).57 In addition, disease risk was ameliorated in NOD2−/− mice after the treatment with antibiotics or anti-IL-6 receptor-neutralizing antibodies. Most interestingly, the transfer of dysbiotic microbiota into germ-free wild-type (WT) mice again caused the development of colitis and CAC. Likewise, transplanting the normal microbiota from WT mice into NOD2−/− mice reduced disease risk.57 These findings exemplify a role of microbial communities in inflammation and carcinogenesis. Furthermore, these observations propose that the manipulation of a dysbiotic microbiota could offer a possible therapeutic approach in the treatment of CRC and other human intestinal diseases. 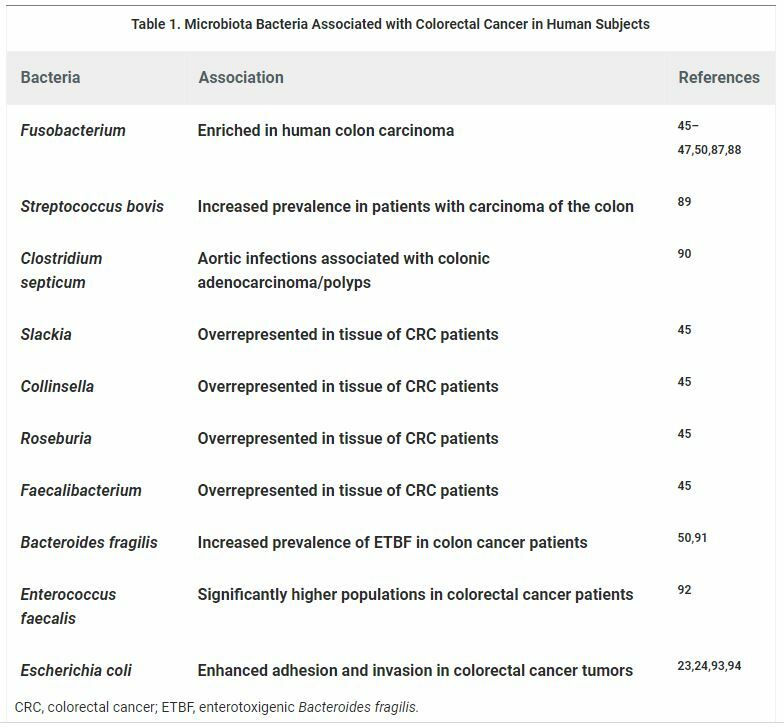 In light of potentially distinct functions of bacterial groups in colonic tumorigenesis, a bacterial driver–passenger model for CRC was proposed.58 Bacterial drivers are defined as intestinal bacteria with pro-carcinogenic features that may initiate CRC development. For instance, a pro-carcinogenic feature of particular E. coli strains, harboring the genotoxin colibactin, can induce single-strand DNA breaks, and thereby increase the mutation rate of infected cells.22 Another bacterial CRC driver was identified in a mouse model of ETBF-induced colitis and carcinogenesis. In this model, ETBF can enhance tumorigenesis, possibly through the induction of a persistent TH17-type inflammatory response, causing DNA damage and genetic instability in human cells.26,59 In humans, potentially pathogenic Enterobacteria, such as Shigella spp., are rare in healthy individuals, but are overrepresented in nonmalignant colonic mucosa of patients with adenomas.60,61 This finding supports the early CRC-stage association of such species with the intestinal mucosa, suggesting a role for bacterial drivers. In contrast, intestinal bacterial passengers constitute relatively poor colonizers of a healthy colon that have a competitive advantage in the tumor microenvironment and, therefore, outcompete bacterial drivers of CRC. For example, the distorted colon wall structure in a tumor microenvironment may expose the collagen fibers in the basement membrane, allowing access to bacteria such as S. gallolyticus subsp. gallolyticus.62 Accordingly, the prevalence of S. gallolyticus subsp. gallolyticus in the general population is much lower than that found in patients with colonic adenomas and CRC samples,45–47,63 suggesting that these microorganisms represent bacterial passengers. Another example of potential bacterial passengers are the Fusobacterium spp., which are found consistently overrepresented in tumor samples45–47 with no clear role in CRC development and progression. This would support the idea for a role of Fusobacterium spp. as passenger bacteria. While the driver–passenger model does not exclude passenger bacteria as active culprits of tumor progression, it rather suggests that their involvement may be in later disease stages. Nevertheless, the composition of the indigenous rather than the tumor microbiota of patients with CRC would be a more relevant indicator for the risk of developing colon cancer. An increased understanding of shifts in the microbiota would enable the identification of bacterial drivers of colon cancer and thereby provide an invaluable tool for early diagnosis of colon cancer and new prevention strategies. Several studies have highlighted the importance of the microbiota composition in the tumor patient response to chemotherapy or checkpoint blockade immunotherapy.66,67 Of importance here are findings of Sivan et al. (2015) and Vétizou et al. (2015), demonstrating that constituents of the intestinal microbiota can influence the outcome of tumor immunotherapy through the augmentation of dendritic cell activation and subsequent priming of antitumor T cell responses.68,69 In light of the heterogeneous antitumor immunity of patients, the identification of microbes that may serve as biomarkers for predicting therapeutic responses as well as maximizing the benefit of clinical cancer immunotherapy, is an obvious growing field of research. Mechanistically, microbes may promote carcinogenesis by different processes, such as toxic metabolite production and genotoxic biosynthesis,70 providing a further CRC treatment approach. A recent study aimed at inhibiting toxic effects of colibactin toxin-producing E. coli, which represent frequent colonizers of CRCs. Two boronic acid-based compounds were identified, which were shown to bind to the active site of the ClbP enzyme involved in the synthesis of colibactin, and shown to suppress DNA damage and tumorigenesis induced by pks-harboring bacteria.71 While confirming the importance of colibactin toxin-producing E. coli in colon tumorigenesis, this study also provides a novel family of inhibitors to target pks-harboring bacteria in the treatment of CRC. In animal models, environmental and dietary factors, including the intestinal microbiota, seem to play a critical role in the early stages of CRC formation. Even though no direct link between the colonic microbiota and the initiation of intestinal tumorigenesis in humans has yet been established, a growing body of evidence suggests that the selection of genotoxic bacteria might play an important role in CRC initiation and promotion. Alterations in the microbiota composition and function that were thought to be a passive reaction to changes in the microenvironment might in fact be an active contributing factor to the development of CRC. The notion of a causal link between dysbiosis and CRC opens a field of microbial genes as potential biomarkers for CRC.84–86 An increased understanding of bacterial community shifts taking place in the context of CRC, will allow for future therapeutic and preventive strategies, based on intestinal microbiota modulation and microbe–host interactions, which may form a crucial part of the armamentarium against this lethal type of cancer. For references, abbreviations used, and to view this article in its entirety click here. BioResearch Open Access, published by Mary Ann Liebert, Inc., provides a rapid-publication forum for a broad range of scientific topics including molecular and cellular biology, tissue engineering and biomaterials, regenerative medicine, stem cells, gene therapy, systems biology, virology, among others. The above article was first published in the October 1, 2018 issue of BioResearch Open Access with the title “Diet, the Gut Microbiome, and Colorectal Cancer: Are They Linked?”. The views expressed here are those of the authors and are not necessarily those of BioResearch Open Access, Mary Ann Liebert, Inc., publishers, or their affiliates. No endorsement of any entity or technology is implied.